Google recently announced an upgraded version of Rich Snippets—Rich Cards. 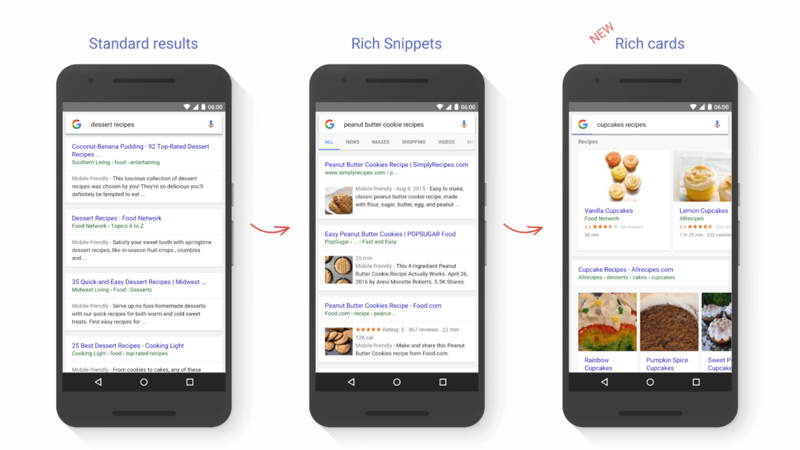 Google’s Rich Cards appear in organic mobile search results for recipes and movies. Rich Cards offer an enhanced visual design from the former Rich Snippets. Users are able to view a carousel of images with star reviews and the brand name. Google’s results have evolved substantially, from standard search; to Rich Snippets, which offered an image accompanied by a description; to Rich Cards, which primarily offer visuals with little text. Brands should follow the structured data requirements in order to appear for Rich Cards. Search engines, social outlets and retail sites are increasingly providing consumers with visual tools (e.g. Pinterest’s Visual Search, Amazon’s Visual Search App, Google Reverse Image Search, etc.). Users are seeking a richer, more relevant search experience. By providing images in place of text, consumers are able to quickly retrieve the information they need. Brands that have the opportunity to surface in the form of Rich Cards should ensure that their content is optimized to reach consumers that are expressing interest in their products or services. To demonstrate, if consumers are searching for a particular type of recipe, say “apple pie recipe,” brands should conduct additional keyword research to uncover the types of keywords for apple pie recipes that will lead the consumer to convert. Then, the brand has a better chance of appearing in the search engine results page (SERP) and encouraging consumers to visit their website and convert, whether that involves purchasing a product used in the recipe, watching a video, sharing or e-mailing the recipe, etc. Brands should continue to create new content that engages readers. In the event that a brand is seeking to present recipes through Rich Cards, they should create new recipes and content that revolve around the consumer. Brands should understand what types of recipes their target audience is seeking—are they quick meals? Desserts? Seasonal recipes? Finding out what type of content most intrigues a brand’s audience is crucial to leading the consumer down the path-to-purchase. Ideally, for brands to appear in Rich Cards, they should focus on optimizing copy with fresh keywords and content to appeal to the consumer, create new content that relates to consumer search queries and optimize the images that are placed in Rich Cards for SEO Value. To learn more about Rich Cards, contact your Performics account team today.